Obey and serve the Lord beloved . . . I Require Greatness From Each of My Children! “I require greatness from each of My children, but pay attention to My voice; greatness is serving Me and My Kingdom, waiting at the gate to obey My Words. Greatness is delighting to do what I have said in My Word. It is serving your brothers and sisters in My house. It is not as the world sees greatness. Every time you give of all that I have given you, to really serve another, selflessly, that is when I AM glorified. A change of heart and mind is necessary in order for you to live your life in real prosperity. For as you die to your self, that is when you will truly live the life that I will make center-stage. Many desire greatness, but miss the mark in My House! Know that I AM looking within to find the pure in heart. I will join with you in your efforts to be more like Me. For I sent My Son as a servant to all in order that many more servants would be born. He gave His life in order to cause many more to really live! This year begin to walk out one of My secrets revealed; in order to be great, you must be a servant. You will find those things that have evaded you up until now will begin to be attracted to you. You will begin to notice that it is not so hard to prosper in every area of your life. To those with this purity of heart and a genuine motive to minister or wait upon Me and those in the Kingdom, revelation will abound. It has always been this way. In order to gain your soul, you must lose it, in order to receive you must give, this is the way I operate, and the way My children move and grow in the Kingdom. Abundance in the midst of lack is what I do best, for the Kingdom is greater than the world’s system, it cannot be stopped. So, make up in your heart and soul to be great by serving, and you will rise above all that is formed against you this year and for all times. What others consider small, I see as great, and My vision is perfect. “So Jesus called them together and said, “You know that the rulers in this world lord it over their people, and officials flaunt their authority over those under them. But among you it will be different. Whoever wants to be a leader among you must be your servant, and whoever wants to be first among you must be the slave of everyone else. For even the Son of Man came not to be served but to serve others and to give his life as a ransom for many,” Mark 10:42-45. “I do not consider, brethren, that I have captured and made it my own [yet]; but one thing I do [it is my one aspiration]: forgetting what lies behind and straining forward to what lies ahead, I press on toward the goal to win the [supreme and heavenly] prize to which God in Christ Jesus is calling us upward. So let those [of us] who are spiritually mature and full-grown have this mind and hold these convictions; and if in any respect you have a different attitude of mind, God will make that clear to you also. Only let us hold true to what we have already attained and walk and order our lives by that,” Philippians 3:13-16. 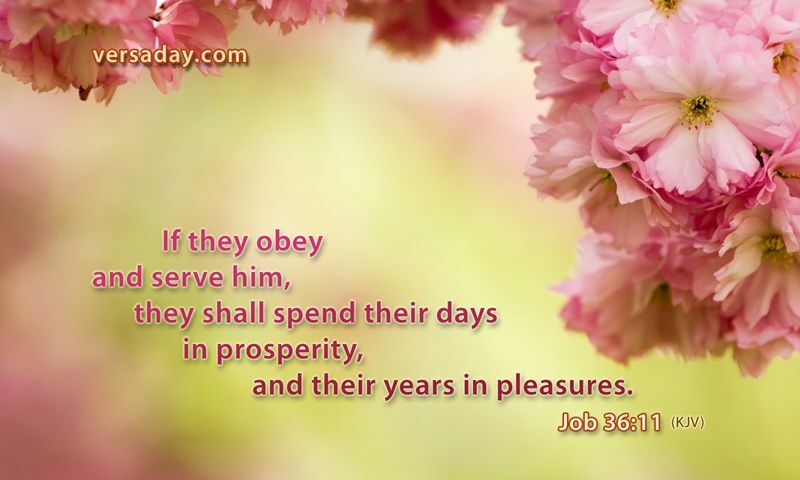 “If they obey and serve Him, they shall spend their days in prosperity and their years in pleasantness and joy,” Job 36:11.